Today I went to CVS for a quick scan of my card to get my coupons and the big friendly red machine spat me out SO MANY coupons I was standing there for quite some time picking them apart! The other fabulous coupon that popped up today was a $2 off any CVS body wash, which will make it FREE as they are on 2 for $4 sale this week!! 2 cans of AMP energy drinks - $3 for 2, get $3 back in extrabucks so I did that transaction first! THEN! 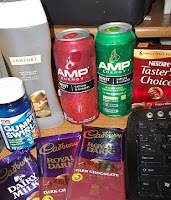 I picked up a pack of CVS gummies, a bodywash, some coffee stick packs and 3 bars of chocolate! I used the $3 worth of extrabucks for the transaction and the gummies coupon, plus the $2 bodywash coupon and a b1g1 free coupon on the chocolate, which was already buy 2 get 1 free so I got 3 for the price of 1! (I would have gotten 6 as I have 2 more b1g1 coupons, but they were all out of chocolate!! - I did get a rain check!). Not bad for $3 and some change, I needed those vitamins, and you can never have too much bodywash! !